A true story of acceptance, perseverance, and the possibility of love and redemption as evocative, charming, and powerful as the New York Times bestseller Following Atticus. Drawn by an online post, Tom Ryan adopted Will, a frightened, deaf, and mostly blind elderly dog, and brought him home to live with him and Atticus. The only owners Will ever knew had grown too fragile to take care of themselves, or of him. Ultimately, Will was left at a kill shelter in New Jersey. Tom hoped to give Will a place to die with dignity, amid the rustic beauty of the White Mountains of his New Hampshire home. But when Will bites him numerous times and acts out in violent displays, Tom realizes he is in for a challenge. With endless patience and the kind of continued empathy Tom has nurtured in his relationship with Atticus, Will eventually begins to thrive. Soon, the angry, hurt, depressed, and near-death oldster has transformed into a happy, gamboling companion with a puppy-like zest for discovery. Will perseveres for two and a half years, inspiring hundreds of thousands of Tom and Atticus’s fans with his courage, resilience, and unforgettable heart. 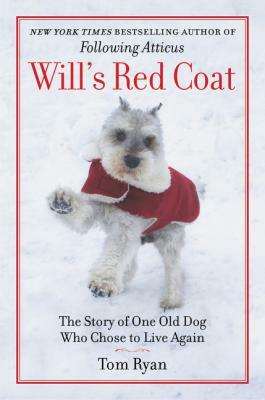 A story of a dog and an indelible bond that is beautiful, heartbreaking, uplifting, and unforgettable, Will’s Red Coat honors the promise held in all of us, at any stage of life. Will’s Red Coat includes eight pages of color photographs.